When we were at the 4:1 ratio, this was a method that I came up with to combine a large portion of fat with a vegetable, the goal was to visually “bulk up” a meal. The amount of vegetables can sometimes look incredibly small sitting on a plate, trying to serve 15g of carrots in 11g of butter has resulted in meal refusal on more than one occasion in our house. This is intended to be a side dish to be served alongside a protein. This recipe is very flexible, you can use any vegetable or seasonings you like. You will have to enter (into the ketocalculator) the needed ingredients of this recipe + a protein and possibly extra fat to meet individual needs. I almost always used this on nights when the oven was already on, I have cooked it at many different temperatures, it has always turned out ok! Don’t be afraid to change the proportions of cream, egg and butter. As long as the egg is included, it will cook up just fine. In a small oven safe bowl, mix all of the ingredients together. Cook this in a water bath, this will prevent the cream from burning. Find a second oven safe dish (like a 2 cup Pyrex dish), set the vegetable custard dish inside the larger dish. Fill the space between the two dishes with very hot water. Carefully place both dishes in the oven and bake until the top has puffed up. For the amounts listed above, the quantity will be about 1/4 cup serving. This should take about 15 minutes in a 350 degree oven. I usually serve some type of vegetable with dinner so I would cook a small portion plain to use for this dish. Chop the cooked veggies very small and mash them with the back of a spoon in the dish you would cook them in. I never have a large quantity of pureed vegetables on hand to make this. I would save the extra eggs from scrambled eggs in the morning for a dish like this. I keep extra egg in a small cup like this. If I start to build up a supply of extra egg, I’ll stick it in the freezer! 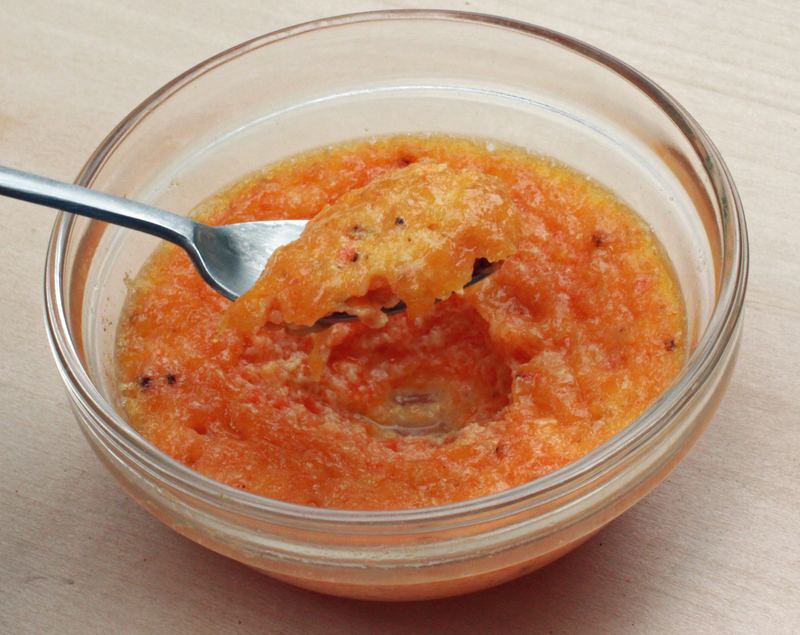 You could use pureed baby food vegetables if you prefer. You would have to change the calculation to include pre-made baby food.